Wike-Up! is a new concept of Aquabiking. The main goal is to exercise in the water combining the incredible benefits of the water and the exercises. You don’t have to be a strong athlete to use Wike-Up !. Whether your goal is to do some daily healthy exercise, lose some weight, get in better shape, do some cardio or prepare to any competition (triathlon, biking race,….) Wike-Up! is the best answer in the comfort of your own pool. A Wike-Up! workout is fun, comfortable because you practice in the comfort of own pool challenging because you can do exercise at all levels, and very effective as shown by different clinical studies. The Wike-Up! Aqua bike is for the entire family of any age and any levels. If you are injured (knee, legs, cardiovascular restrictions) and you are unable to workout on land Wike-Up! is the answer too. 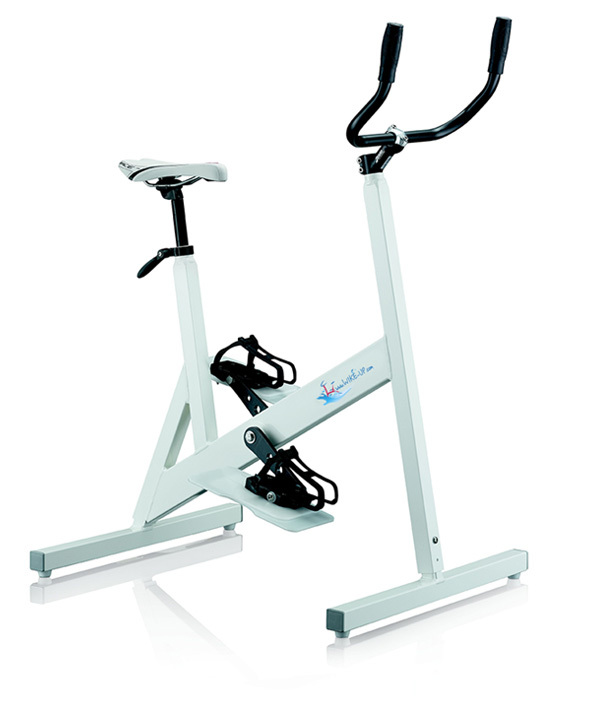 Many rehab center are using the benefit of aqua biking to improve the results. Order your Aquaness by Wike-Up! aquabike today to enjoy increased respiratory endurance, muscular strength, flexibility, balance, coordination, agility, power, speed, and reaction time. Wike-Up! MAXIMUM RESULTS WITH MINIMAL EFFORT !